There is something inexpressibly exhilarating about standing before an audience, whether in the palpitating atmosphere of the recital hall or the unnerving virtual environment of the recording studio, with only a piano and melody guiding one’s precarious steps along the precipice. Like Bellini’s somnambulistic Amina as she toddles high above her bucolic village, the Lieder singer has no safety net, no parachute, no cabled harness steadying his gait. In the most magical instances, however, the Art of Song is conjured like the iridescent bridge that conveys Wotan and his companions to Walhalla. Such instances are why the notion of positioning singers before the horns of phonographs was conceived more than a century ago and why the Classical recording industry remains an embattled but vitally necessary pillar of today’s culture. Perhaps it is true that, as some observers allege, fewer recordings of genuine merit come to market now than in previous generations, but a recording like this performance of Franz Schubert’s seminal 1824 masterwork Die schöne Müllerin always justifies the wait. One of the earliest Lieder cycles in the modern sense, Die schöne Müllerin remains popular with singers of every Fach, but few of them have recorded a Schöne Müllerin as spellbinding as this one. This performance lures the listener into a fascinating microcosm, sometimes claustrophobic in its intimacy, that derives inspiration from music and words and inspires the hearer to abandon predispositions and prejudgments gleaned from other recordings and devote complete attention to these remarkable Lieder as though encountering Schöne Müllerin for the first time. Considering that the poems by Wilhelm Müller that inspired and provide the texts for Die schöne Müllerin were published in 1820, only four years before the first publication of the Lieder cycle, and that Schubert was occupied during the period in which the bulk of the songs were written, from May to September 1823, by the composition of his large-scale opera Fierrabras, the cycle’s gestation was surprisingly brief. Melodic fecundity and interpretive depth were seemingly as readily available to Schubert as they were to Mozart, and both qualities imbue every bar of Die schöne Müllerin. The nuances of Müller’s verses are given avenues of expression by Schubert’s music that would never be possible in even the most intelligent recitation, the poetry of the music highlighting the musicality of the words. The extent to which Schubert identified personally with the cycle’s sentimental journey from exuberant youthful optimism to bleak despondency precipitated by unreciprocated love continues to be debated by biographers and musicologists. There are far more questions than answers about details of the composer’s amorous pursuits, but the psychological depth with which he amplified Müller’s words suggests at the very least a profound connection with the subject matter. That connection is perpetuated in this performance, in the context of which both singer and pianist are no less committed to communicating the subtleties of Die schöne Müllerin than Schubert was when he fused Müller’s texts with his music. 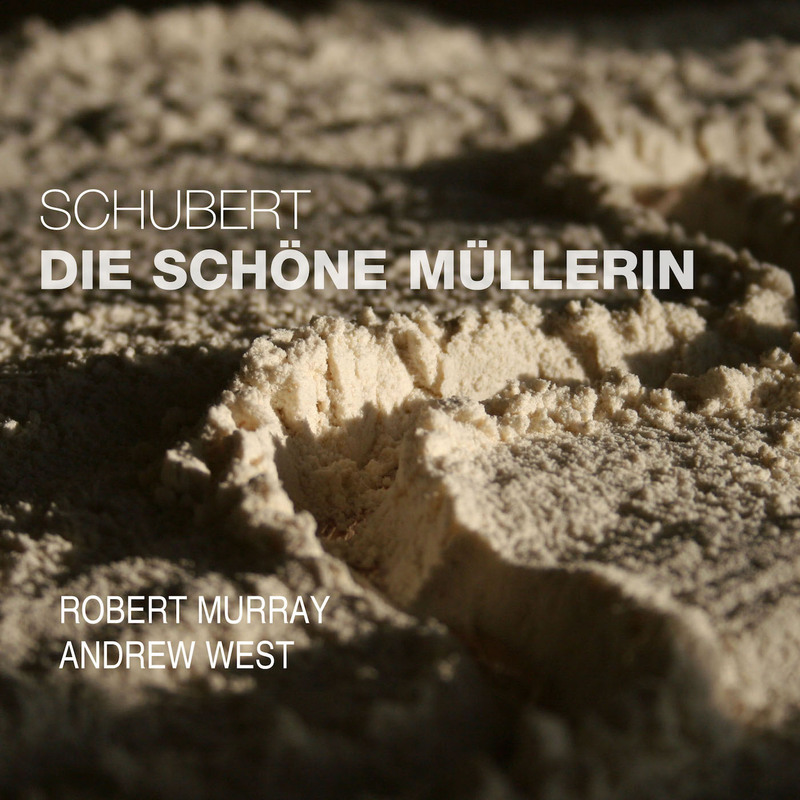 Whether the music at hand is the work of Sammartini, Schubert, or Schönberg, any performance benefits from the participation of gifted, dedicated musicians, and this performance of Die schöne Müllerin is defined by the keenly intelligent handling of Schubert’s music by tenor Robert Murray. A noteworthy master of a varied repertory who was especially delightful—and atypically glamorously-voiced— as the charismatically romantic Frederic in the 2015 English National Opera production of the Gilbert and Sullivan gem The Pirates of Penzance, Murray is not unknown to aficionados of beautiful tenor singing. Both his attractive, evenly-produced natural instrument and his talents for subtle, insightful interpretation merit preservation on recordings, his portrayal of Marzio in Classical Opera’s Signum Classics recording of Mozart’s Mitridate, re di Ponto [reviewed here] having shone amidst high-wattage performances, and his singing on this disc is as strong a raison d’être for this handsomely-produced Stone Records account of Die schöne Müllerin as is the quality of Schubert’s music. No man is an island in Lieder repertory, however, and Murray’s partner in this Schöne Müllerin, pianist Andrew West, is an artist of equal accomplishment and perspicacity. A member of the faculty of the prestigious Royal Academy of Music and a panelist on the jury of the 2014 Kathleen Ferrier Competition, in the 2003 edition of which Murray was a prizewinner, West is a collaborative musician of the first order. Equally acclaimed as a soloist and a partner to other musicians and singers, West is no mere accompanist in this performance of Die schöne Müllerin. Building upon years of cooperation, his fingers are as integral a part of the interpretation of Schubert’s music on this disc as Murray’s vocal cords. As Murray and West approach the cycle in this performance, the first four Lieder form an engrossing portal into both the narrator’s physical surroundings and his emotional state. Murray sings ‘Das Wandern’ with boyish charm, his rhythmic buoyancy, perfectly complemented by West’s playing, conveying the bounce in the youth’s step as he explores the world before him. The depth of understanding between singer and pianist is especially evident in ‘Wohin?’ and ‘Halt!’ Here and in ‘Danksagung an den Bach,’ tonal richness from both musicians adds a dimension of dramatic excitement to the cycle’s progress. Murray does not hesitate to provide full-on, open-throated, operatic tone when the emotional ethos of music and text warrant it, and some of the most unforgettable moments in this Schöne Müllerin come when Murray and West flee the polite salon and allow the songs play out as though their action were being brought to life in the opera house. That this is achieved with any of the cycle’s inherent introspection bring sacrificed is a particular success of this performance. ‘Am Feierabend’ and ‘Der Neugierige’ launch another sequence that escorts the listener ever further into the recesses of burgeoning inner torment and its outward manifestations. Murray sings these and ‘Ungeduld’ with penetrating insightfulness, using his bright vowels and crisp consonants to illuminate the text in a way that renders the words’ significance unmistakable. His is an account of ‘Morgengruß’ that radiates simplicity and faith in new beginnings, but West’s handling of the piano part elucidates the uncertainty that lurks beyond the music’s deceptively orderly façade. The very different moods of ‘Des Müllers Blumen,’ ‘Tränenregen,’ and ‘Mein!’ are traversed by Murray and West with unaffected eloquence, and the pianist’s probing use of Schubert’s harmonies as expressive devices in ‘Pause’ melds with the tenor’s intuitive management of phrasing in the bittersweet melodic lines of ‘Mit dem grünen Lautenbande.’ Where many performances begin to drag, this one soars, gaining momentum with each Lied and escalating tension by finding within each song its function within the broader scope of the cycle. The visceral energy of West’s playing in ‘Der Jäger’ enhances the idiomatic sparkle of Murray’s diction, the words charged with the same electricity that races through the music. Throughout this Schöne Müllerin, Murray articulates the text with the flair of a native speaker of German and the sagacity of one who has devoted considerable time to studying the literal and figurative meanings of the words. There is never an indication of lugubriousness in ‘Eifersucht und Stolz’ or ‘Die liebe Farbe,’ both of which are sung and played with ideal tempi, dynamics, and balance between voice and piano. The expressive heavy lifting in this performance is entrusted to the words: rather than attempting to force a comprehension of the cycle upon the listener, this Schöne Müllerin invites participation, the kaleidoscopic incandescence of Murray’s vocalism providing ethereal perspectives that enable the listener to form his own unique interpretation of the music’s message. The sheer attractiveness of tone lavished on ‘Die böse Farbe’ and ‘Trockne Blumen’ is tremendous, making the songs satisfying solely as pure music, but there is always a reason for beauty in this performance: things which cannot be spoken without harshness must be sung especially beautifully. Widely viewed as the narrator’s paean to the relief from his despair found in death in the waters of the brook, ‘Der Müller und der Bach’ is in this performance not without a discernible vein of pragmatism. The bleakness and inevitability of the poet’s perception of fate gain from the unexaggerated forthrightness of Murray’s singing an element of serenity that offers a glimmer of redemptive hope in the face of self-annihilation. This sense of magnanimity that permeates Murray’s and West’s reading of ‘Der Müller und der Bach’ is expanded in ‘Des Baches Wiegenlied’ into an examination not of the unforgiving finality of death but of its transcendence of earthbound cares; to borrow a conceit from Shakespeare, its shaking off of mortal coils. The brook flows on, and so, too, does the cycle of anticipation, fulfillment or disappointment, and renewal. Some singers focus so doggedly on devising identifiably unique interpretations of a work like Schubert’s Die schöne Müllerin that they seemingly overlook the most basic tenet of any performance of the cycle: singing. Whether one takes the metaphysical dimension of Die schöne Müllerin at face value or ascribes to it relevance of cosmic proportions, the fact remains that these Lieder are first and foremost music. Ernst Haefliger and Erik Werba were sensitive to this distinction forty years ago, and Robert Murray and Andrew West exhibit this to today’s listeners with sensitivity and sophistication. Played with virtuosity, sung with beauty and fearlessness, and interpreted with wit and discernment, this is a Die schöne Müllerin in which Müller’s words and Schubert’s music sound astonishingly new.